About 1 month my brand new B9 A4 developed a creaking noise from the left C-pillar area whenever I turn, go up and down inclines, basically everytime the chassis has to flex. Took it to the dealer thinking it was just a loose plastic trim. To my surprise the mechanic found the defect to be due to 2 body sheet panels that was moving against each other. They claimed all the welding points and bolts were intact and there was cracking of any metal parts. However, they had to perform "spot welding" to fix the problem. The problem is fixed now, and I did notice prior that the left rear seatbelt housing plastic trim was noticeably looser compared to the other side and if I press down on it hard it would reproduce the creaking noise. While the service manager was quick to dismiss that this issue impacted chassis integrity or safety, I'm still a little concerned given it's a brand new car and I'm not sure if the problem arose from another faulty assembly elsewhere. Has anyone ever had or heard of this kind of problem before? 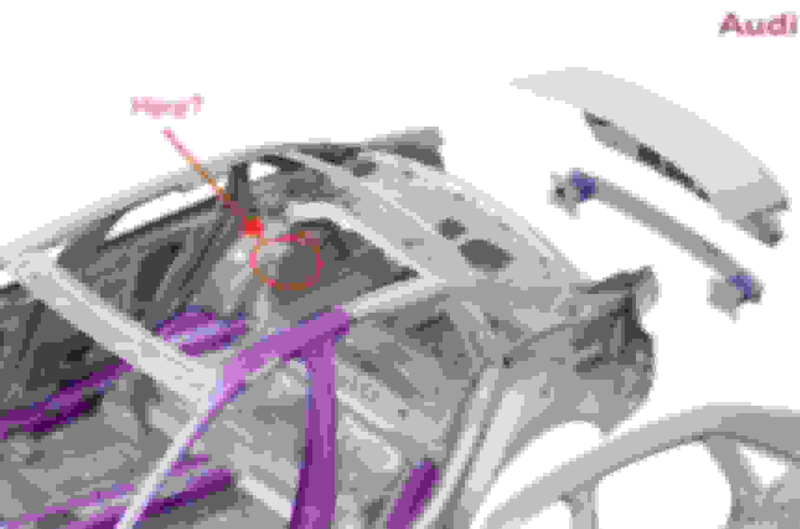 I've attached a photo that the body shop took to show me the location as I would have to remove a lot of trim pieces in the trunk to see it. I've also found a photo where I think the problem area is to better orient those who are interested. Do I have grounds to escalate with the dealer for a buyback for what seems to be a small problem that's fixed now, and I don't know how a lemon law can even apply here? If it was my car, I wouldn’t have let the dealer take my car apart and spot weld body panels that were done by precision robotics welding in the factory. Some chassis flex is normal in cars and it doesn’t compromise chassis integrity or safety in accidents. I don’t think lemon law would apply in your case unless the problem repeats couple of more times or your car stays in the shop beyond the duration that is set by your state lemon law. I’ve seen this issue on A5 forum as well. It’s not that uncommon. If it was my car, I wouldn’t have let the dealer take my car apart and spot weld body panels that were done by precision robotics welding in the factory. Since the car is 1 month old I assume this was covered under warranty, so whatever method the dealer used must have been approved by Audi otherwise the dealer wouldn't get paid. Not sure about Audi in particular, but most manufacturers require dealers to use approved equipment to carry out warranty work. This means for welding they are usually required to use highly advanced welding machine that automatically sense the thickness and the composition of the material and adjust the welding power, pressure and time. This aren't the type of welding machine you buy from Harbor Freight and used by shadetree mechanics. Last edited by IMYM; 07-10-2018 at 07:33 AM. I guess it's somewhat reassuring I'm not the only one dealing with this. It's disappointing that the chassis manufacturing design "allows" for this in certain vehicles. I have the same issue with European B9 A4. Obviously, I can't say for sure the cause is the same, but the symptoms are: creaking from behind me whenever the chassis flexes, be it turning or breaking. OP, how long did you have to wait for the repair? I see that someone mentions 2 weeks, seems a bit long. How long did it take for them do diagnose the issue? Not that long. Dealership identified the cause the same day, and it took 3 more days for them to send the car to a bodyshop for spot welding. You may be able to save some time by pointing this potential problem out to them when you bring your car in. I remember being able to recreate part of the noise by pushing down on the plastic covering for the rear passenger seatbelt housing. If you look at the diagram I posted, that body panel "misalignment" causes everything in that rear corner to be slightly off and if you compare to your "normal" side all the trim pieces in that area seems to cause more noise when you push on them. Thank you. I can't see the misalignment, but sometimes I can recreate the noise by pushing the shelf behind the seats. I'll see what they say. Yeah sounds like you have the same issue. Here's a post showing the same problem but they heard the noise from the speaker shelf. I had/have what sounds like the exact same issue in my B9 A4 (US '18) - a metallic "creaking" sound from the rear of the vehicle when it flexes. Took to dealer shortly after purchase and they heard and acknowledged the issue. They had my car for almost a month and half, in which time they 1) replaced struts, 2) replaced rear wheel house assembly, 3) performed spot welding (through preferred body shop). I was told that Audi Engineering was directing the repair attempts. All in all, after getting my car back, the issue was still occurring. Back to dealer a second time, they did some more spot welding and installed some noise deadening material. No better. Took it back a third time, they sent it back to the body shop and coordinated with Audi field engineer to reassess. Long story short, the dealership called me in and said they could not give me my car back in good faith as all of the body work they attempted to it did affect the structural integrity. They offered to put me into an identical vehicle, effectively a Lemon Law claim without going through the formal, legal process. During this ordeal, I was in two separate B9 A4 loaner vehicles.... BOTH exhibited the same issue that I was experiencing in mine, to varying degrees. I took delivery of my replacement A4 in August. Initially, it seemed to be free of the issue. Shortly after, I did begin to notice it occurring in the replacement A4 as well - this time coming from the rear passenger side. It has not been as consistent as in my prior A4, but it is definitely the same noise. It tends to occur when driving over dips in the road, as opposed to raised bumps. Turning into commercial establishments, where there is prevalent transition from roadway to parking lot/driveway, and the car is in a turning posture while moving forward, it is extremely noticeable. Needless to say, I am very frustrated with what appears to be a relatively widespread issue. Other than this issue, I love my A4.